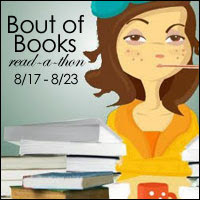 Bout of Books 14: Shhh, I’m Reading! Published on August 17, 2015 August 17, 2015 by Rachelle J.
I want to be able to finish at least 4 books, but I’m hoping I’ll be able to finish 5. I will be posting an update each day with the titles of the books I’ve finished and the total number of books I’ve read. If I wasn’t able to finish a book that day, I’ll put the number of pages read instead.